Christmas is a time that has been set aside to celebrate the birth of Jesus, but so often the meaning of Christmas is lost in the hustle and bustle. God gave the ultimate gift of His son Jesus, so that we could have everlasting life with Him, and be called son's and daughters of God (John 3:16-18, 1 John 3:1). This gift was given out of the heart of the Fathers great love for us, and it is too precious of a gift to keep to ourselves! This year, instead of making Christmas all about the decorations, the treats, and the gifts (although, all of those things are ok in their proper place), let's shift our focus onto sharing Jesus with others, by showing them God's kind of love. Jesus said that all men would know that we are His disciples by the love we show to one another. (John 13:35) If we truly want to make Jesus the reason for the season, let's give the gift of God's great love to others this Christmas! 1. Make Jesus the focus of your Christmas celebration with your family. Before opening gifts, take time to pray together, and read the account of Jesus’ birth (Matthew 1:18-25, Matthew 2:1-12, and Luke 2:1-20). 2. Give the gift of joy to those around you by getting a group together to sing Christmas carols! Some of the best places to visit are nursing homes, hospitals, and even your own neighborhood! 3. Make a birthday cake for Jesus, and sing to Him! This is fun especially if you have little ones, and it puts the focus on Jesus' birth, and celebrating Him, rather than the gifts and toys. 4. Give the gift of time by volunteering at your local food bank, shelter, or salvation army. 5. Find ways to bless families in your community. Whether you give the gift of toys, gas or grocery cards, or even make a warm meal for someone, a simple act of generosity can show the love of God in a powerful and tangible way! 6. Visit, send a card, write a letter, or call someone who may be lonely or experiencing grief during the holiday season. It may not seem like much to you, but this one simple act of kindness may be the brightest moment in that persons darkest hour. 7. Donate a portion of the funds that would typically go to buying Christmas cards (or gifts) to a charity. Someone I know introduced me to this idea a few years ago, and it has blessed my heart ever since! 8. Pay for someones meal, coffee, or groceries. You never know how this random act of kindness may make their whole day, and it will most likely leave a lasting impression of God's love. 9. Go through your closet (or kids closet) and donate clothes, boots, shoes, and coats to local organizations or shelters. 10. Invite someone who may be lonely to one of your Christmas celebrations. Sure, it may be breaking tradition a bit by having someone new join, but I am convinced that there is no greater way to show God's love than to bring them into a house full of love when people need it most! 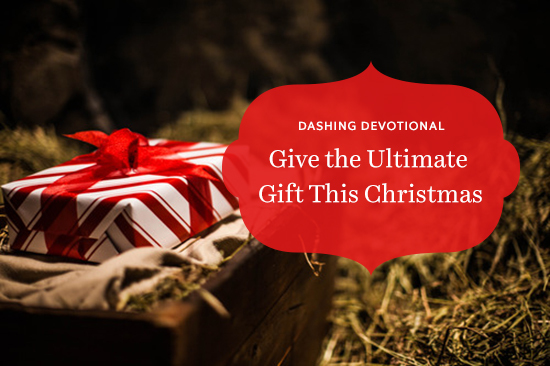 I hope this filled you with some great ideas to show God's love that you can incorporate this Christmas, and maybe even make some of them your new Christmas traditions! When we turn our focus to others, and care for them in simple ways, we are essentially giving them the ultimate gift- God's love! On a final note about giving, I want to take a moment to thank each one of you for your generosity! If you support Dashing Dish, you have been a part of giving this past year in a HUGE way! Last year, we started an extension of Dashing Dish, called Dashing Delivery. God put it on our hearts to put the ‘Dashing’ into Dashing Dish by delivering groceries and grocery gift cards to those in need. Thanks to you guys, we have been able to give over $6,000 in groceries and grocery gift cards to families in need in one years time! Every month, we pray and ask the Lord where to give, and He is more than faithful to connect us with families. We also donate to our churches food pantry on a monthly basis, who not only feeds the hungry, but shares Jesus with them! I am sharing this with you today, because if you have supported Dashing Dish you are also a part of this ministry. I want to thank you from the bottom of my heart for all of your support, and for helping us spread the love of God in a tangible way!